Heads up everyone, Target is officially beginning the merge of the Cartwheel app and the Target app. Don’t worry they aren’t getting rid of Cartwheel offers or really changing the program at all, they are just merging the two apps together. 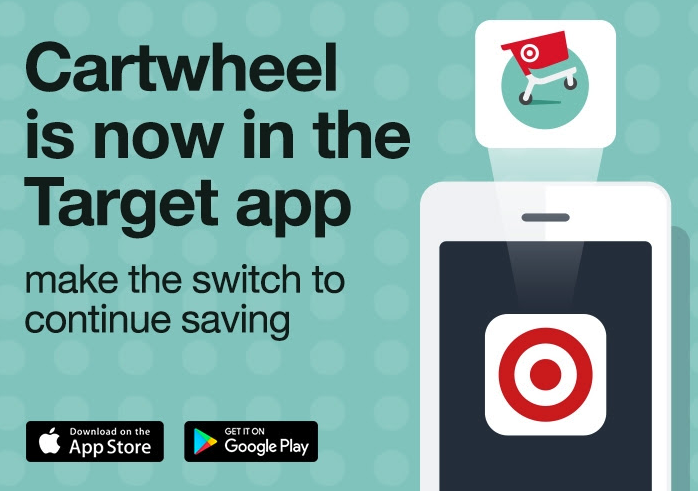 You will still use the Cartwheel app like you did in the store, but this way for Target you might also do a little shopping through their mobile app (that’s their hope anyway). The only thing that will change for some of you is how you log in. If you’ve been logging in through Facebook, the app will require that you now log in with a Target login. For me I already had a Target login but couldn’t remember what it was… just follow the prompts and it will help you figure it out if you are like me. As of November 1st you won’t be able to find the Cartwheel app in the app stores. Your old Cartwheel app will keep working through early 2018 but then you’ll be required to switch to keep using the coupons. Head to the app store of your choice and search for Target to find the main store app.